Enjoy wonderful family vacations in Weston! 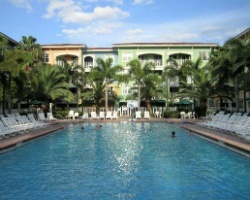 Resort close to restaurants, shoppings, & more! Buyer may receive a title fee credit, inquire for details! The luxurious *Mizner Place* is located in the popular South Florida Bonaventure Spa, Tennis, and Golf community, home of the renowned Cliff Drysdale Tennis Center! Conveniently located within steps of your front door are restaurants, shopping, and nightlife located at the Town Center Shoppes. Tennis, golf, swimming, and a full schedule of activities are provided throughout the Vacation Village properties. Fort Lauderdale is only 25 miles away. To discover more, visit www.vacationvillageresorts.com. *RCI Gold Crown Resort* Featuring a finely appointed 2 bedroom, 2 bath lockout suite that will accommodate 8 guests comfortably. Usage is biennial even in week 38. For more information or to make an offer, please submit the inquiry form.